Thomas Gardner - The Road from Whitby to Durham. 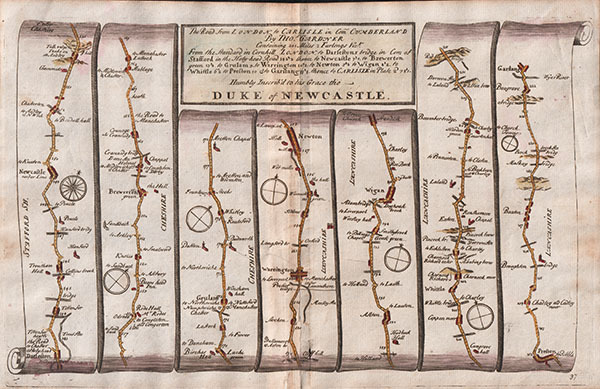 An antique strip map, which shows The Road from Whitby to Durham. From Whitby to Shallingdam, Gisborough, Marton, Norton, Sedgfield to Durham. Then continued from Durham to Dunderland to Tinmouth. This is Plate 99 in "Pocket Guide to The English Traveller" published by Thomas Gardner in 1719 with later hand colouring. Thomas Gardner - The Road from London to Carlisle. 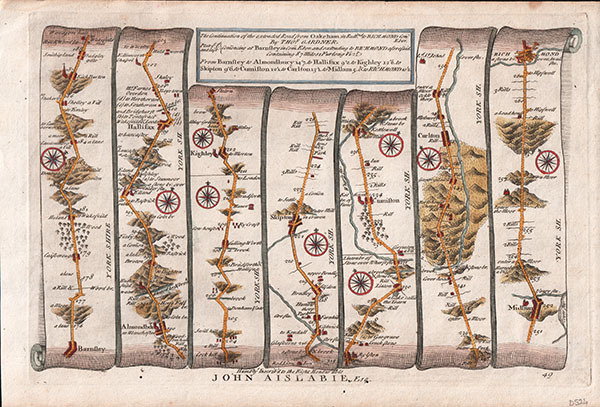 An antique strip map, which shows The Road from London to Carlisle. From Darleston Bridge to Newcastle, Brewerton, Grulam, Warrington, Newton, Wigan, Whittle, Preston, Garstang to Carlisle. This is Plate 37 in "Pocket Guide to The English Traveller" published by Thomas Gardner in 1719 with later hand colouring. Thomas Gardner - The Continuation of the Extended Roadfrom Okeham to Richmond. An antique strip map, which shows The Continuation of the Extended Roadfrom Okeham to Richmond. Commencing in Barnsley to Almondbury, Hallifax, Kighley, Skipton, Cumiston, Carlton, Midlam to Richmond. This is Plate 49 in "Pocket Guide to The English Traveller" published by Thomas Gardner in 1719 with later hand colouring. Thomas Gardner - The Continuation of the Road from London to Barwick. 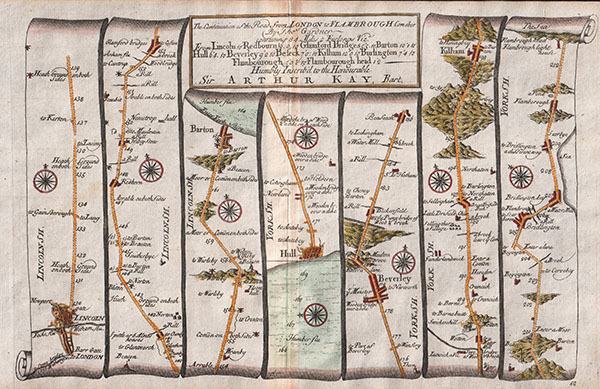 An antique strip map, which shows The Continuation of the Road from London to Barwick. Beginning at Tuxford to Bautrey, Doncaster, Wentbridge, Tadcaster to York. This is Plate 7 in "Pocket Guide to The English Traveller" published by Thomas Gardner in 1719 with later hand colouring. Thomas Gardner - The Continuation of the Road from London to Flamborough. An antique strip map, which shows The Continuation of the Road from London to Flamborough. From Lincoln to Redbourn, Glamford Bridges, Barton, Hull, Beverley, Beseck, Kilham, Burlington, Flamborough to Flamborough Head. This is Plate 42 in "Pocket Guide to The English Traveller" published by Thomas Gardner in 1719 with later hand colouring. 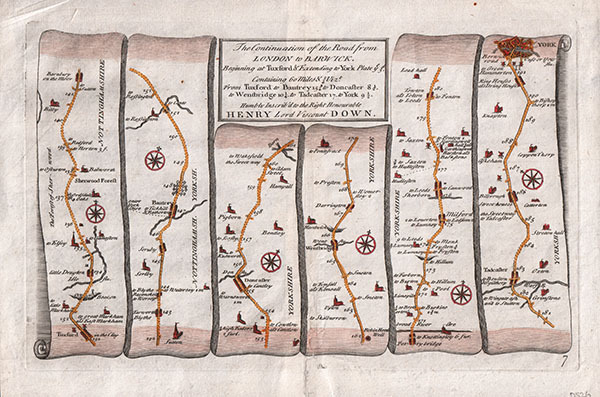 An antique strip map, which shows The Continuation of the Road from London to Barwick. Beginning at York to Burrowbriggs, Topcliffe, Northallerton, Darlington, Durham to Chester in the Street. This is Plate 8 in "Pocket Guide to The English Traveller" published by Thomas Gardner in 1719 with later hand colouring. An antique strip map, which shows The Road from Ferrybridge via Farnborn, Mickelfied, Abyforth, Bramum, Wetherby, Welsford, and Boroughbridg to Rippon and continues via Huton, Wath, Burniston, Leming, Catterick, Brunton upon Swale, Richmond, Gailes and Eaglestonby to Barnard Castle. The map also shows the Road from Ferrybridge via Pontefract to Wakefield. This is Plate 95 in "Pocket Guide to The English Traveller" published by Thomas Gardner in 1719 with later hand colouring. 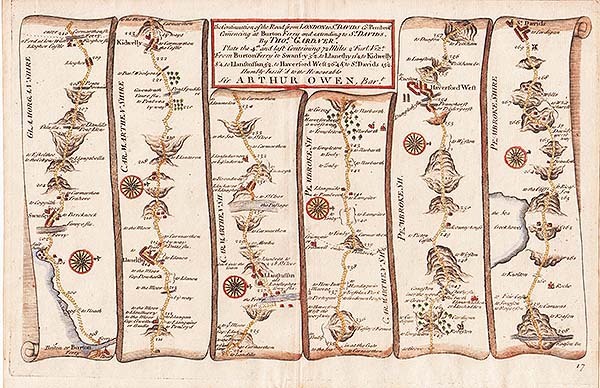 An antique strip map, which shows The Continuation of the Road from London to St. David's. From Burton Ferry to Swansey to Llanethy to Kidwelly to Llanstuffan to Haverfordwest to St.David's.........". This is Plate 17 in "Pocket Guide to The English Traveller" published by Thomas Gardner in 1719 with later hand colouring. Thomas Gardner - The extended Road from Okeham to Richmond in Yorkshire. An antique strip map, which shows The extended Road from Okeham to Richmond in Yorkshire . From Oakham to Milton Mowbray to Plumtree to Nottingham to Papplewick to Mansfield to Clown to Aughton to Rotherum to Wombwell & to Barnsley. This is Plate 48 in "Pocket Guide to The English Traveller" published by Thomas Gardner in 1719 with later hand colouring. 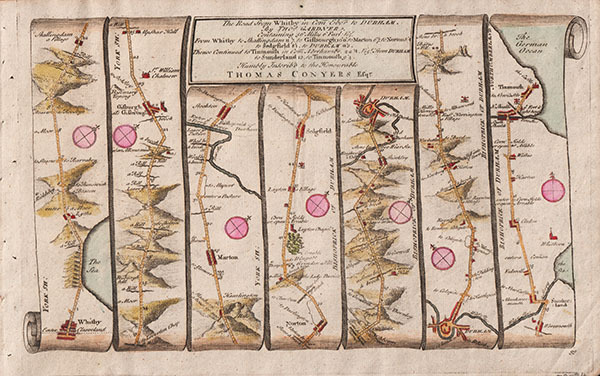 Thomas Gardner - The Continuation of the Road from York to West Chester. An antique strip map, which shows The Continuation of the Road from York to West Chester. From Warrington to Frodsham to the City of Chester. 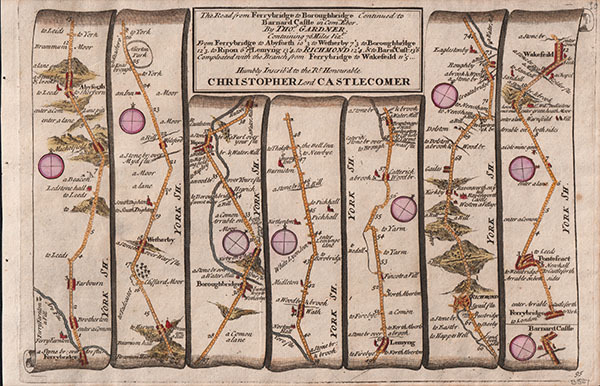 Then from Manchester to Stockport to Disley Deyn to Buxton to Lathkel to Brassington to Weston Underwood to Derby.This is Plate 90 in "Pocket Guide to The English Traveller" published by Thomas Gardner in 1719 with later hand colouring. Thomas Gardner - The Road from Welshpool Montgomery to Carnarvan in North Wales. An antique strip map, which shows The Road from Welshpool Montgomery to Carnarvan in N. Wales. From Welshpool to Llanvair to Dinas Mouthy to Dolgethe to Llandura to Harlech to Dolbenmer to Carnarvan. This is Plate 87 in "Pocket Guide to The English Traveller" published by Thomas Gardner in 1719 with later hand colouring. Thomas Gardner - The Road from Chester to Cardiff. An antique strip map, which shows The Road from Chester to Cardiff. From Llanbedr Vuneth to Llanbedr Vaur to Bealt to Brecknock to Pontstucketh where enter Glamorgansh & to Cardiff. This is Plate 64 in "Pocket Guide to The English Traveller" published by Thomas Gardner in 1719 with later hand colouring. Thomas Gardner - The Road from Shrewsbury and Chester to Holywell, Flint. 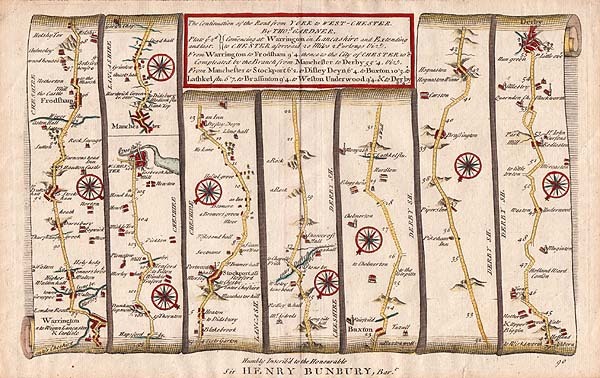 An antique strip map, which shows The Road from Shrewsbury and Chester to Holywell, Flint. From Shrewsbury to Ellismeare to Wrexham to Mould to Holywell and from Chester to Flint to Hollywell. This is Plate 98 in "Pocket Guide to The English Traveller" published by Thomas Gardner in 1719 with later hand colouring. Thomas Gardner - The Road from St. David's to Holywell. An antique strip map, which shows The Road from St. David's to Holywell. From St. David's to Fishguard to Newport to Cardigan to Llanarth to Llanrusted to Llanbadervaur near Aberistwith to Talybont. This is Plate 66 in "Pocket Guide to The English Traveller" published by Thomas Gardner in 1719 with later hand colouring. An antique strip map, which shows The Road from Chester to Cardiff. From Chester to Wrexham to Sellattyn to Llanfylen to Llanvelling to Llanfair to Tregunon to Newtown to Llanbader Vuneth. This is Plate 63 in "Pocket Guide to The English Traveller" published by Thomas Gardner in 1719 with later hand colouring.